2 – Plan ahead! There is always a long list of deadlines and obligations to follow before a show, so sooner is always better. 3 – Map out a realistic budget. For best results, talk with an exhibit house about what you’re looking to achieve and for what price. 4 – Consider renting your trade show booth. Rentals offer the power of flexibility to a business, without breaking the bank. 5 – Pick your spot. Examine the show floor plan to determine whether there are any “obstacles” that might be a hindrance to your space. 6 – Play by the rules. Know each show’s height restrictions, what kinds of signs are allowed, and how booths must set up within a space. 7 – Make your booth a “must-visit” presentation site. Providing a theater section as part of your layout can be ideal for presentations. 8 – Consider lightweight, portable options. Emerging businesses can save money and make life easier with innovative new portable displays. 9 – Stand tall. You can tower above the competitions’ structures with the maximum height tower that the show floor allows. 10 – Explore the two-story option. Expand upon your physical space and design canvas with a double deck rental booth. 11 – Know where the competition is on the trade show floor. Depending on your strategy, you may want to be close by…or as far away as possible! 12 – Fabric walls are a great trade show booth solution. The flexible texture is becoming more and more popular due to its versatility. 13 – Be a comfy oasis on a busy trade show floor. Add a hospitality lounge complete with device charging stations to help lure traffic. 14 – Shine a light on your booth. Nothing draws the eye to an exhibit space quite like lighting effects such as shifting LED lights. 15 – Draw attention to your booth with signs. Including an eye-popping hanging sign as an element of your booth has gravitational pull. 16 – Don’t clutter your trade show booth space. Simple, modern, clean, and uncluttered is a recipe for timeless booth aesthetics. 17 – Accentuate the booth design to highlight your brand. Artistic feature walls are a feature that has been trending. 18 – Plan for demo stations. For product demos that require stations, sketch out in your mind how many you need before the design process. 19 – Be cool and current. Don’t go with old-fashioned styles. Explore what works for your brand by downloading our latest design style guide. 20 – Don’t get too wordy with your graphics. Verbage should be limited to short, easy to digest messages with attractive visuals. 21 – Select the right size monitor. If you are having a video screen, make sure it’s the right size for where people will be standing. 22 – Be classy from the ground up. Consider a beautiful hardwood flooring that provides a psychological “at home” feel. 23 – Printing is important. UV printing enables production of more vibrant images and colors for booths than ever before. 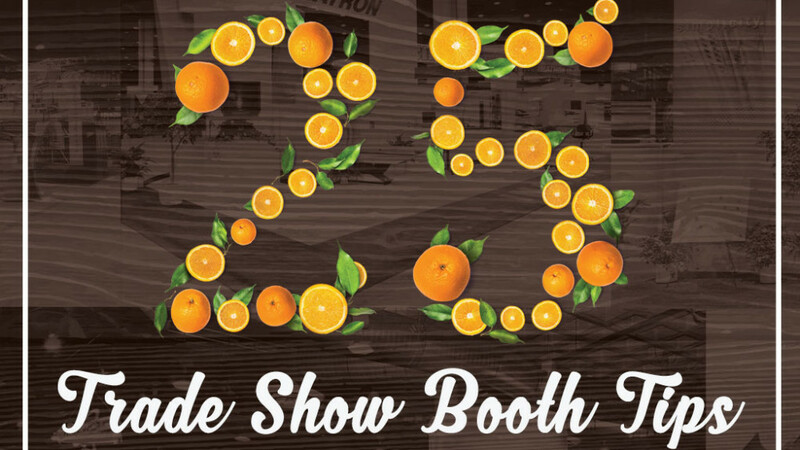 24 – Make your team part of the trade show booth experience. Have your people stand in a location that is accessible and welcoming. 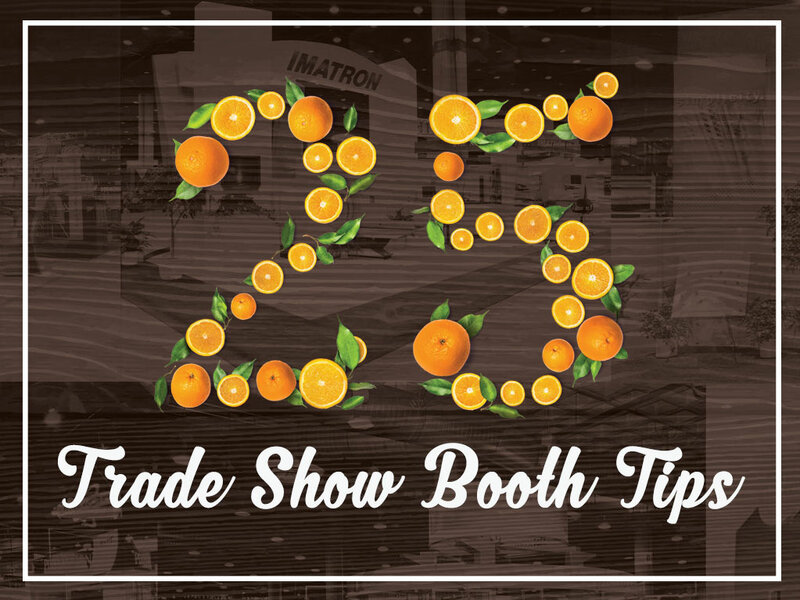 25 – Pick vendors with strong trade show experience. They will be well-versed on aspects of the exhibit world you may not know much about!